Web Wednesday : BarcampHK is back! Hong Kong's biggest user-generated unconference is back on 15th November at the Chinese University of Hong Kong in Shatin, New Territories. Started back in December 2007 by Angus Lau, Steve Fleischer, Napoleon Biggs, Aaron Farr, Marcel Ekkel, Mikael Öhrén and Ben Lee with the first gathering in the Yahoo! offices in Causeway Bay, the event has now grown to over 600 local geeks, entrepreneurs, activists, artists, social commentators and thinkers who come together for one day to share their passion and tech knowledge in a relaxed, multi-lingual atmosphere. Find info about past BarcampHK events on this blog (not all, unfortunately), the Wiki page and Flickr (2007 and 2008 and others). Find barcamp on Facebook and Twitter. A GIANT SHOUT-OUT to Ben Lee and Belle Liu who make this event such as success every year. If you're curious to learn more about the grass-roots of tech creativity in Hong Kong, put aside all your weekend obligations and head over to the Esther Lee Building at the Chinese University of Hong Kong on Saturday 15th November, 2014. 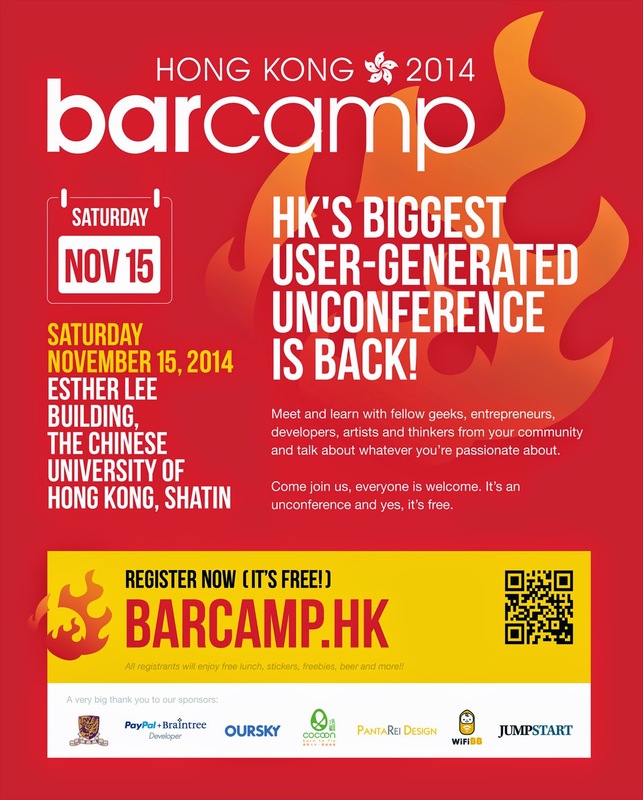 Register only at barcamp.hk and get your hands on a free lunch, stickers, freebies, beer and more!! The agenda is loose, like all good "un-conferences" but here is a structure that you can work to.